The Sunshine Act (otherwise known as the Open Payments Program) comes with plenty of regulations about how pharmaceutical, biotech, and life sciences organizations report on their spending. This means that these companies are responsible for managing a new set of data in order to report all payments and gifts to healthcare providers. 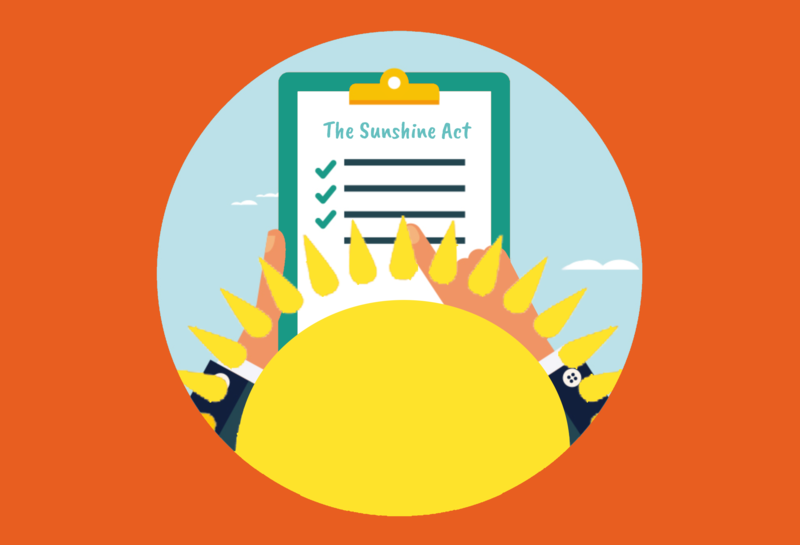 Here’s your Sunshine Act compliance cheat sheet. This is a law passed in 2010 meant to increase transparency regarding gifts or payments to particular kinds of medical professionals. The result is that companies need to accurately report on how much they spent providing gifts or items of value to any physician (with some exceptions) or to any teaching hospital. What does the Sunshine Act do? The goal of the Sunshine Act is to reduce conflicts of interest between bio/medical manufacturers who might provide goods, meals, speaking fees, or services in order to spread word about their products and healthcare providers. Its purpose is also to separate marketing or promotional activities and training, research, and professional development. the name of any third party who also received the payment. Do these regulations affect international organizations? Yes. Europe in general (and France in particular) have their own requirements when it comes to the same kind of reporting. These laws, called Loi Bertrand in France and EFPIA Disclosure Code in Europe, also require that gifts provided to healthcare providers are reported. What if I have other more specific questions? The legislation is complex, so you’re bound to have plenty of other questions, perhaps specific to your organization’s situation or not. For those questions, check out the Centers for Medicare and Medicaid Services official website full of frequently asked (and very specific) questions. What solutions can simplify this reporting process? All of this information can be a challenge to manage and report on in a way that doesn't cost the pharmaceutical organization a lot of time and money in administration and management. That's where Sunshine Act compliance software comes in. As part of the expense reporting solution, employees can use this software to connect the expense report and the medical professional's NPI and other information, bringing all data together in a way that's easy to report. Partnerships between expense reporting providers and third-party data providers make reporting simpler and faster. Some of those third-party data providers include MedPro Systems, IQVIA (formerly IMS Health and Quintiles), and aPureBase, all of which manage healthcare provider (HCP) data, including NPI, address, and specialty. Another benefit of automated software is the fact that all data is auditable and reporting/analytics is made simple. You get a secondary review with an auditable trail and reports, like reports on payment amounts or types, can be generated to fit your specific needs. Get more information on what Sunshine Act compliance software is right for your pharmaceutical, life sciences, and biotech organization.